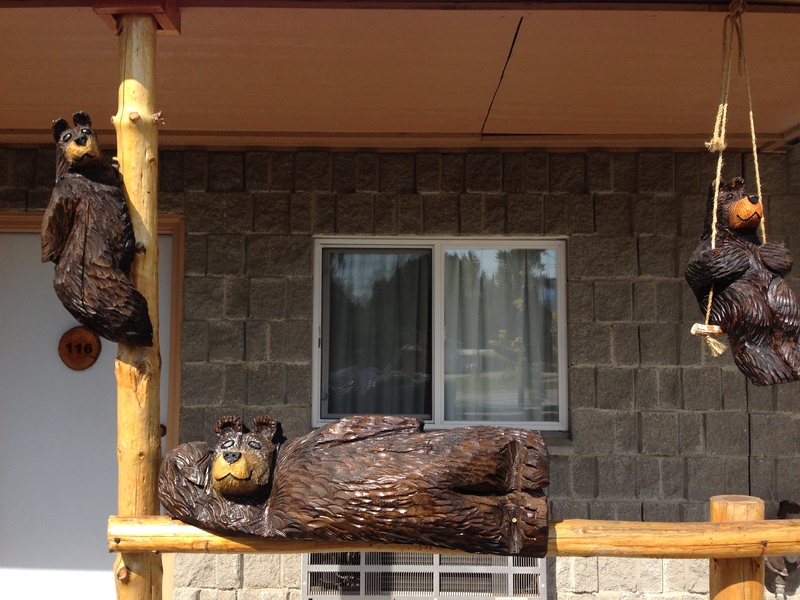 Bears like the Eagle’s Nest Motel in Priest River, Idaho. They lounge on the railings, shimmy up poles, and dangle from porch swings. We spent a couple of nights there this summer while attending a family reunion at nearby Diamond Lake, and all I could think was that someone with a knife – or chainsaw? – had had a really good time carving all those smiling bears. They made us laugh every time we came back to our room, even on the night when a storm had blown down trees, and we had to navigate the branch-strewn roads back to our motel in darkness. I looked up Halas and found that in 1972, at age 50, she went back to school to earn her doctorate in counseling psychology. She joined the women’s movement and focused on counseling women. In a small Idaho town, in a small library, in a small room, I found a book, and in that book was the voice of a foremother. Ancestral voices spoke throughout that weekend. I heard the calm, kind voice of my grandfather, who had built the family cabin, in the roof-beams and plank floors. I heard my grandmother’s easy conversation in the quilts and tole paintings hanging on the walls. Sunday morning, we gathered in a neighbor’s garage to remember them and the others who were not here to eat blueberry pancakes with us: uncles, an aunt, a cousin. For each of the departed, someone stood and told stories, and the tissue boxes were passed up and down the tables. And then we hugged and sang, and it seemed as if all our voices together made a song that every one of us had always sung and would always be singing, and the ones we could no longer see and touch were singing with us, and that was how we would hear them now, and that was okay; that was good. And then we got to those blueberry pancakes. The night before, the storm had hit. My uncle had got word that a bad one was coming, and the neighbors offered their garage for our dinner, and just as fifty members of my family sat down to eat barbecue, the lights went out, and a fierce wind whipped up. Lanterns were lit. We heard a crash like glass breaking. The children were oblivious, digging into mac-and-cheese, but the adults shared worried looks and picked at their dinners. And then the wind was easing, we realized, and within an hour it was over. As soon as someone went outside, we discovered that a huge Douglas fir on our property had fallen – away from the cabin, away from the garage, and into the only empty space between nearby structures, missing even a small shed. It was a tremendous sight that Douglas fir with its roots heaved from the ground. That night, Arline and I drove back to our motel and our cheerful bears. The clerk gave us an electric candle, and we poured wine. The electric candle was tiny, about the size of a stack of three quarters, and its light didn’t flicker like a real candle’s. But in the almost complete darkness of that small town, it was what we had. Our little light. This entry was posted in Uncategorized and tagged aging, books, death and dying, faith/belief, family, feminism. Bookmark the permalink.